The mysterious lights were recorded and shared on social media, where cybernauts were consulted as to their opinion of what the objects might be in an effort to arrive at a logical explanation. What could be involved here? See the photos. 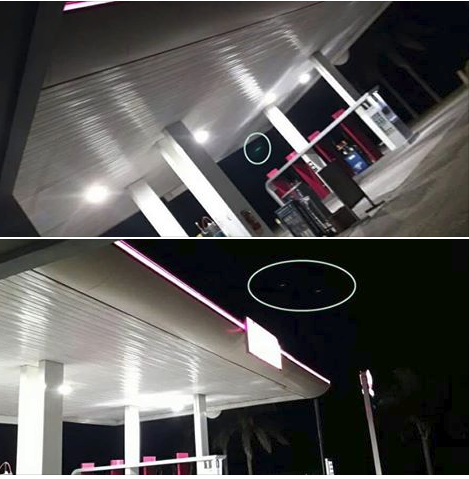 Unidentified Flying Objects (UFOs) were seen last night over the rural region of El Quebracho, Department of La Paz, over the premises of a local filling station. The lights that could be seen and recorded by witnesses were shared on social media, where an effort to find a logical answer to the mystery was made. What could the lights have been? "When we began asking questions, some suggested it could be a rebound effect of artificial lights, since there are dancing establishments in the local canyons. However, given the distance from where the place the photo was taken and Santa Elena, which is the nearest community, we don't believe those two single lights could have been the result," wrote local journalist Oscar Cuenca. A major fire was unleashed in Granja Tres Arroyos, very near the area, causing considerable smoke over the region. "Given the density of the smoke in the air, others think a tube-shaped beam of light would have been necessary for the images to have been produced by a projector," said the reporter. "Ultimately, others said on account of that the thickness of the smoke in the air, the luminous effect was caused by the atmosphere itself, as it was a clear night." Publicado por Terra Incognita en 5:31 p. m.
Erich von Daniken: The Gods are Still Here!